Witness Trees | Where's my backpack? When the first US land surveys were underway in the 1800s and land was being parceled up and distributed amongst settlers, the corners of each section and quarter section were marked either by a post erected on prairie land; or in woodland, by trees marked with a blaze or carving. These trees became known as witness trees, because they bore witness to the accuracy of surveyors’ maps. 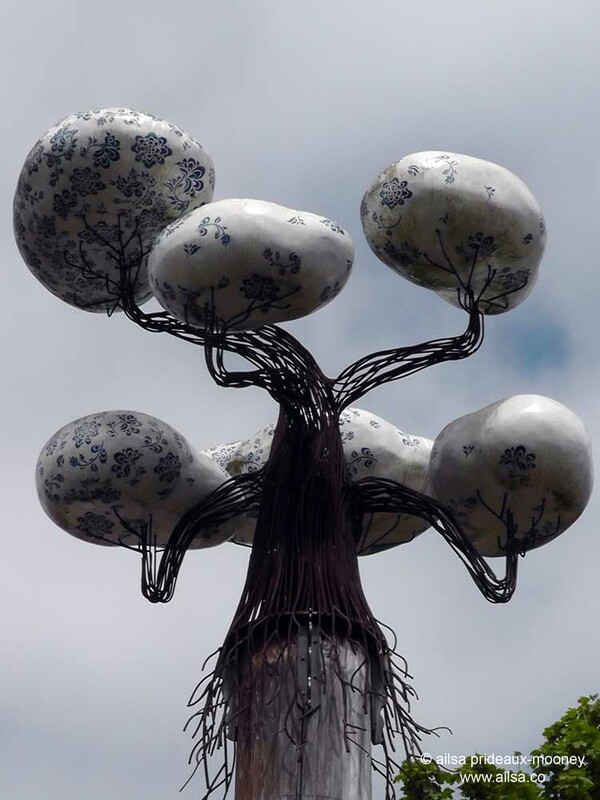 The trees are the inspiration behind artist Jennifer Dixon’s sculptures in the centre of Seattle‘s Ballard neighbourhood. There are five sculptures in total, each one mounted atop an old cedar post. 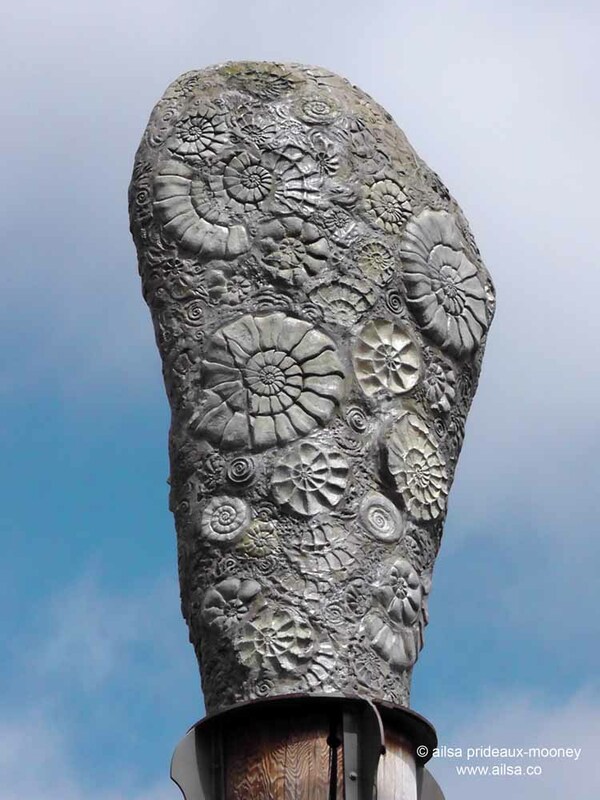 The Fossil Tree is pretty self-explanatory, adorned with imprints of past marine life; but some of the other sculptures take a little figuring out. 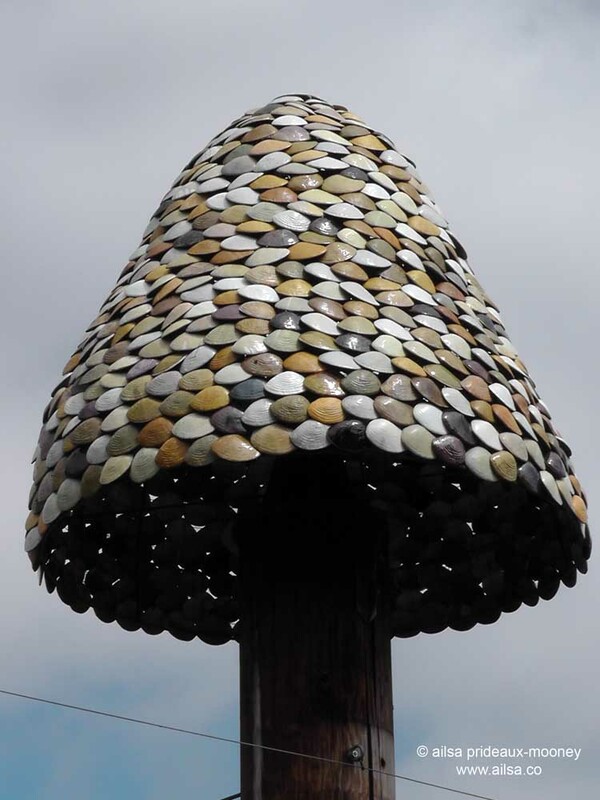 The Clam Tree is a nod to Ballard’s fishing industry and is shaped like an upside down Coast Salish clam basket fashioned out of clam shells. The most bizarre one, The Immigrant or Family Tree, takes its inspiration from the Nordic Yggdrasil, a tree of life, and is meant to represent a hybrid of physical and genealogical trees. The balls mimic topiary in the neighbourhood and the blue and white patterns reflect traditional Nordic folk costumes in a nod to Ballard’s Scandinavian heritage. 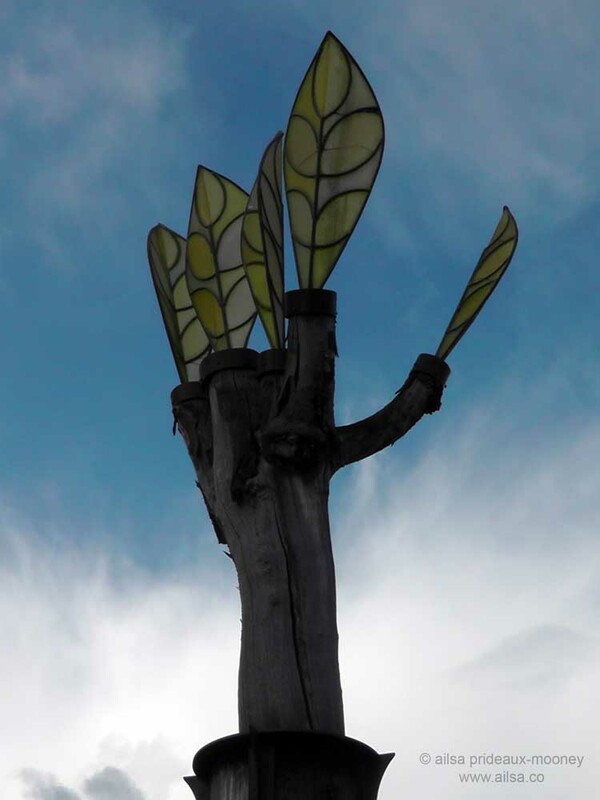 The First Tree sculpture, meant to represent ancient primordial forests that once covered this land, is also a clever homage to the Danish storyteller Hans Christian Andersen, who was an accomplished paper cutter. Often, he would clip away at a piece of paper while telling a story, and then finish with a flourish by unfolding the paper and producing an intricate cut out to his audience. 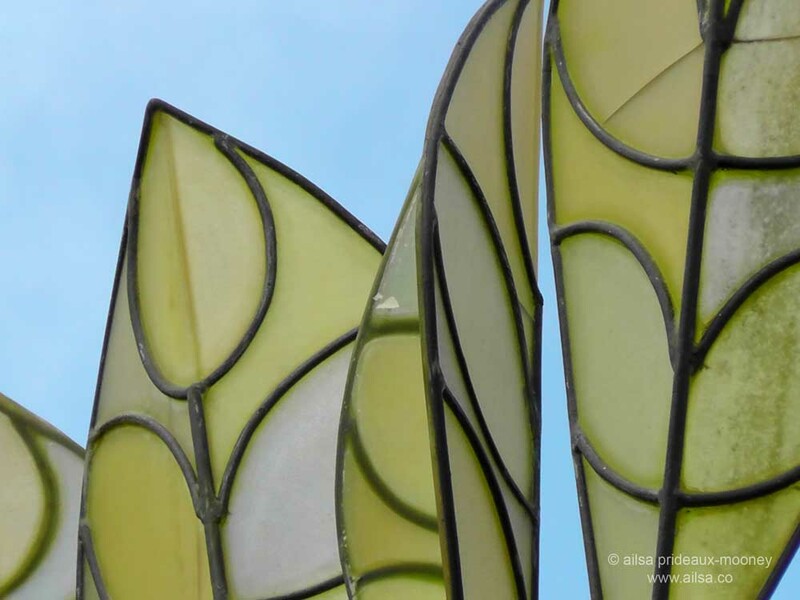 My favourite of the five sculptures is the New Growth tree, a happy flurry of fresh green leaves bursting from old wood. Perhaps it is a wish for the future prosperity of this great little neighbourhood. The Witness Trees are located in Bergen Place; a tiny triangular park between Market Street, Leary Avenue and 22nd Avenue NW in Ballard. Check them out next time you’re in the area. These are fabulous. I’ve never seen anything like these. And your shots are so clear with great perspective! wonderful creativity and storytelling, thanks Ailsa! I neer knew about witness trees, how interesting, and what a creative and facsinating interpretation in these works of art, thanks for sharing! LOve these witness trees = and hope to see them one day – but thanks for the great shots int he meantime. and I like the family tree one th emost – but all are wonderful pieces of art – what a great idea. Thanks for sharing it with us, Ailsa! There are so many wonderful things in the world!!!!! I learned much from your post. These trees offer a wonderful connection between art and history. Brilliant! Interesting historical tidbit and wonderful artwork, each with its own story. Thanks! How beautiful. I love the sculptures. Great post Ailsa. I want to reach out and touch the fossil tree the texture so vivid in your shot. Oh fabulous I love sculpture! How fascinating. I hadn’t heard of witness trees before, so thank you for this post. The sculptures are fabulous – particularly the Immigrant/Family and the New Growth ones. This is so interesting. Thank you for doing such a great job of narrating your story and providing us with great images. I simply have to visit! These are all gorgeous and thank you for telling the story of each tree. I have never heard of witness trees before -but I love to learn new things, especially when told a good story and with great images. cool! what an interesting collection. I especially like The Immigrant! How utterly lovely. Thank you for sharing this great artwork. You do manage to find some marvelous treasures! I was always curious about those trees while living in Seattle. Thank you for the insight! I love and miss Ballard. Cheers! 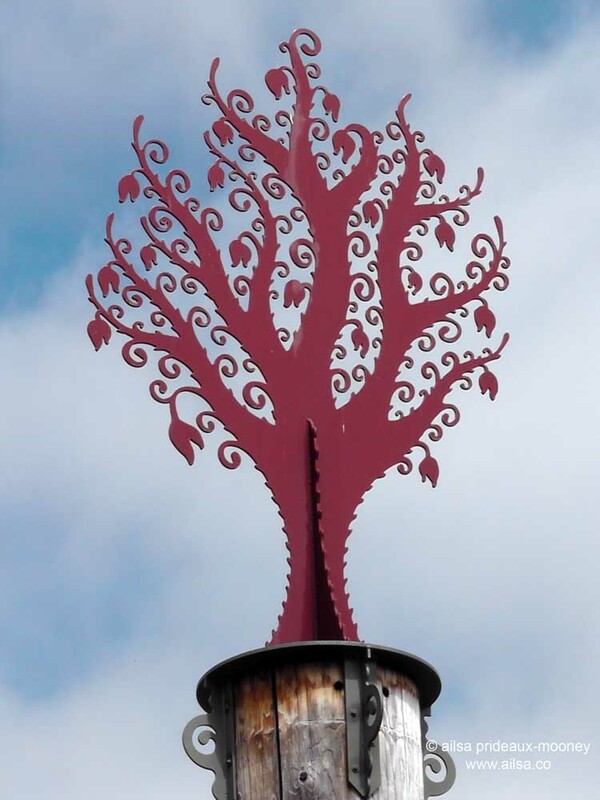 Beautiful and thoughtful sculptures honoring trees and their many functions in our lives…. To gaze up in wonder. Wow, interesting collection. They’re all nice really. I wish I’d known about these before our trip to Seattle last year!